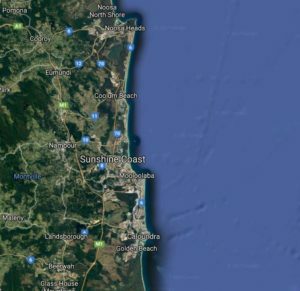 Again, there are many great spots to see with Wolf Rock, Sunshine Reef being the most popular spots near Noosa. However we visit Mooloolaba more often as it is closer to Brisbane and still offers a great diving experience. The Inner and Outer Gneerings. The Gneerings lie north east of Point Cartwright, which is divided into two distinct areas. The Inner Gneerings is an area of reef made up of rocky boulders covered with soft and hard corals. It is good for the student diver and safe for the novice, while it contains enough diverse life and shallow caves to keep the more advanced divers interested as well. It is not deep and has flat table coral, large bushes of red gorgonia, small trees of black corals, sea whips and a stunning area of soft sponge gardens. This supports a myriad of fish; triggerfish, surgeons, leather jackets angels, cod, barramundi barracuda and many small tropical live together in a rainbow of colour. The Outer Gneerings is the same extension of reef as the Inner Gneerings, but a little deeper and further out. It takes on a rather tough and rugged profile, with drop offs, canyons, cliffs and crevices, rising up from 26 metres to within 10 metres of the surface. Because of its distance out the Outer Gneerings pick up more large pelagic fish, and on nearly every dive large schools surround you. Coral growth here is more prolific, with larger gorgonian fans, more sea whips, forests of black coral, larger sponge gardens and terraces of flat plate corals. This is fantastic for the advanced diver and there are still awesome spots for the less experienced. Both Gneerings cover such a large extensive area that it would take years of diving to completely embrace the reef. You’ll be enchanted! Underwater the island is surrounded by sand, has its own rock and coral reef, with a number of boulders covered in tropical growth forming deep gullies and ravines. Painted crays can be found in many of the nooks and crannies and numerous tropicals such as moorish idols, damsels, humbugs and beaked coral fish inhabit the area, along with many pelagics. A large number of nudibranches live on the outer rocks and grey nurse can be found among the rocky gutters from time to time. Old Woman Island is a rewarding dive for novice and experienced divers alike.